Back in 2014, I wrote two posts on the “Central Newton Cultural Commercial District” which is centred around 80th Avenue and 128th Street in Surrey. This part of Surrey was originally an industrial area as it was serviced by the Interurban, and now Southern Rail. 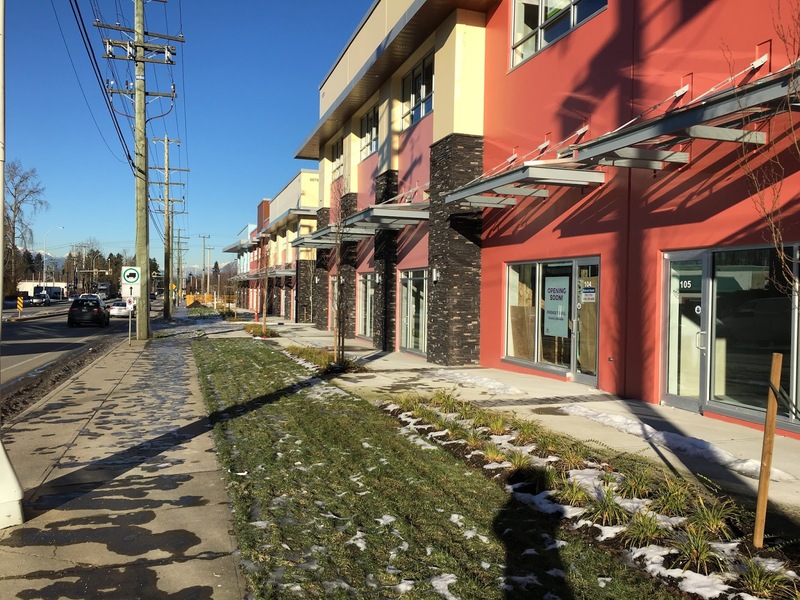 Over the years, the area has transitioned from an industrial area into an area with retail shops and offices that cater to the South Asian community in Surrey. Central Newton Cultural Commercial District around the intersection of 128th Street and 80th Avenue. This area was regionally rezoned from industrial to mixed-employment, formalizing the development of this area as a commercial district. 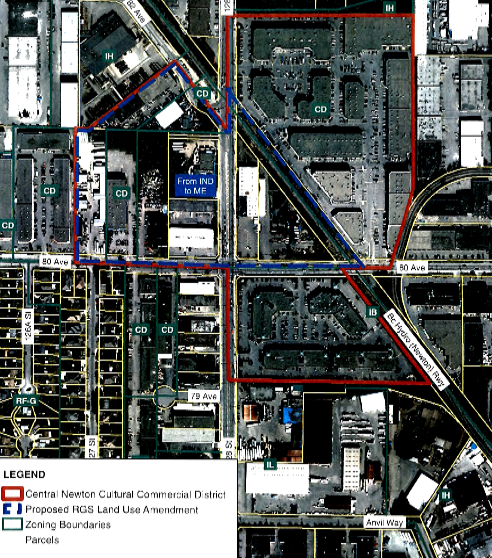 One of the proposed projects in that area was a commercial development at the corner of 128th Street and 80th Avenue. 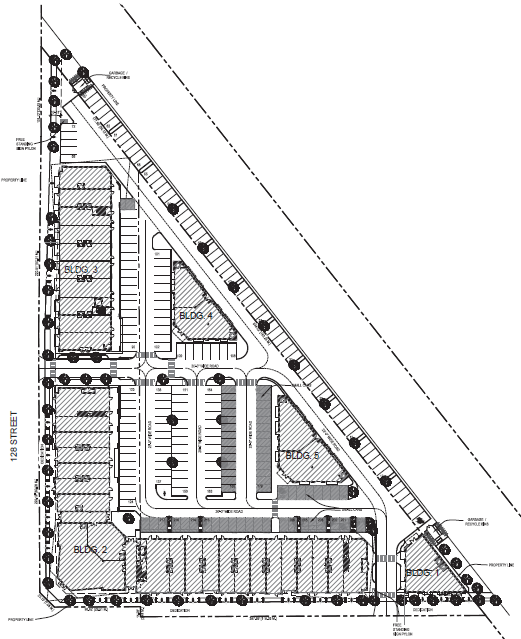 Site plan of commercial development at 80th Avenue and 128th Street in Surrey. Click image to enlarge. I noted at the time that how a building is sited can make all the difference between creating an inviting, walking urban environment, or creating an inaccessible, harsh urban environment. 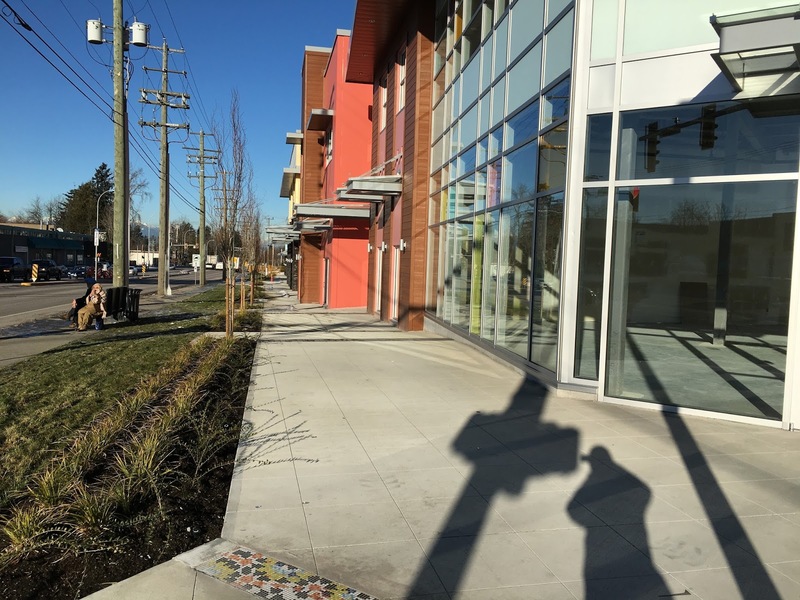 This project is sited such that the buildings front the street, and provide walk-in access from the street. There is still surface parking, but it is hidden in the back of the buildings. 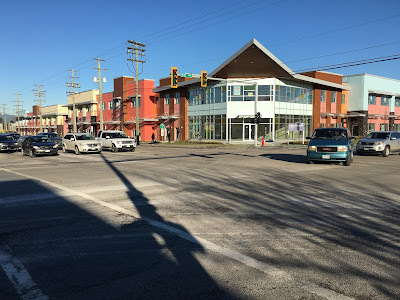 If these buildings were flipped around so that the parking was facing the street, and buildings were toward the back, it would be a typical, inaccessible strip mall. I recently was in the “Central Newton Cultural Commercial District”, and took the following pictures. View of building at 128th Street and 80th Avenue. Select image to enlarge. View of building around 128th Street. Select image to enlarge. View of building from across the 128th Street and 80th Avenue intersection. Select image to enlarge. As you can see, this recently completed project supports walkability. 128th Street does need some changes to make it feel more urban. Over time, and if other projects also put their best face to the street, this area will be transformed into a walkable High Street. Creating an inviting, walking, and transit-accessible community doesn’t require every community to be designed to look like Vancouver. Simple changes to the siting and design of buildings that would otherwise create strip-malls and sprawl, can support place-making and walkability.